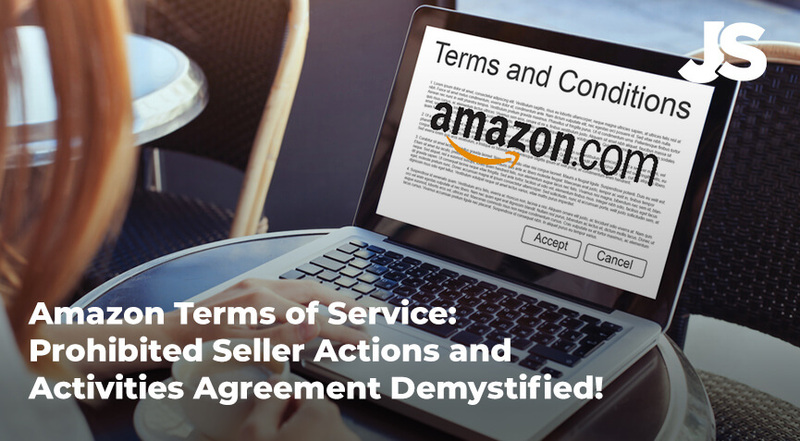 Here at Jungle Scout, we get a lot of questions about the Amazon terms of service and prohibited seller activities and actions agreements. That’s why we decided to post it all here and break down what each and every part of it means. Notes on formatting: I’ve broken each element of the “prohibited seller activities and actions” agreement and simplified it with a proceeding heading, then followed it with the actual content from Amazon’s prohibited seller agreement. For anything else that gets a lot of questions, I’ve included additional details as a ‘Notes from Dave’. Amazon wants to protect both you and the buyers. Amazon can and will ban your product or your business for breaking the rules. Amazon can hold your payments if you break the rules. The prohibited activities and actions portion of the Amazon terms of service is in addition to all other parts of the Amazon terms of service. The seller prohibited activities and actions is for most products and services. Some products and services may have additional guidelines. Don’t try to send buyers away from Amazon. Don’t use business names that try to trick shoppers, are trademarked, or are URLs. Don’t misuse customer phone numbers. You can only send emails through Amazon’s messaging system. Don’t try to break Amazon’s system. Don’t cheat for good reviews. Don’t cheat for sales rank or brag about it in your listing. Don’t abuse the A-to-Z guarantee. Don’t abuse the search engine. Two day shipping confirmations on all media products. Don’t raise prices after the transaction is complete. Don’t create duplicate listings with the intent to trick buyers. Don’t list or match against pre-orderable media products. Don’t upsell additional products during service. Don’t send an unregistered technician in your place. Amazon can and will ban you or your product for breaking the rules. Amazon can hold your payments if they suspend your account. This portion of the Amazon terms of service is in addition to all other Amazon terms of service agreements. Need help finding profitable products on Amazon? Grab our free list of 10,000 profitable niche products! The prohibited seller actions and activities are for most products and services. Some products may have specific guidelines. Notes from Dave: Does this include links or marketing material on or inthe product’s packaging? There’s some debate to this question, and while I’ve heard rumors of people getting in trouble for this, for the most part Amazon doesn’t penalize for it. After all, nearly all major brands and labels do it. We recommend that you don’t go overboard. And if anything, put it inside the packaging, where it’s not as obvious. Don’t use business names that try to trick shoppers, are trademarked, or have a url. Don’t send marketing emails to your customers. “Amazon provides Professional sellers who fulfill their own orders access to customer phone numbers so that they can comply with carrier label requirements. If you receive this customer information, you are required to adhere to Amazon’s customer personal information policy, which can be found in our Seller Agreement. Never contact a customer using their phone number. To contact a customer about their order, only use Buyer-Seller Messaging. Please see our Buyer-Seller Messaging FAQ for more information. You can only send emails through Amazon’s message system. You can only have one seller account (but there are rare exceptions). You must have a separate bank account for each Seller Central account. We will not approve multiple Seller Central accounts that use the same bank account within the same region. If you sell across regions (for example in North America and Europe), you may use the same bank account for your Seller Central accounts as long as your accounts are linked though. “Any attempt to manipulate ratings, feedback, or reviews is prohibited. Notes from Dave: What about promos for reviews? You may not offer compensation for review. This includes free or discounted products. You may ask buyers to write a review in a neutral manner, but you can’t ask for positive reviews. So you can ask for a review through an email message follow up or inside your packaging, but it has to be totally neutral. Nor can you ask for reviews from only the buyers that had a positive experience. You’ve got to ask everyone. The way we interpret this is that you can give away promos. And you can ask for reviews. But you can’t give away a promo for a review. No incentivizing! This is one area that Amazon doesn’t mess around with. Your best solution for getting reviews is using a system like Jump Send to automatically follow up with each and every one of your Amazon customers. You can’t cheat for sales rank or brag about it on your listing. Notes from Dave: Can I give away promos to rank? This is another area where we get a lot of questions. It’s a bit of a gray area for sites that use promotions to boost sales rank, and as we understand it, it complies with the restrictions seen here. However, some of our competitors use methods called “super URLs” to cheat the system, which does, in fact, violate the Amazon terms of service agreement and can potentially put your product and Amazon business in jeopardy. Notes from Dave: What about promos for ranking? Again, this goes back to my notes about cheating to get your ranking up. As far as we’ve seen, the promotional method is okay, like the one used by Jump Send, but jacks such as using “super URLs” is a big no-no. Two-day shipping on media products. “Matching product offerings inaccurately: When you list a product for sale using an existing product detail page, the product being offered must be listed on a product detail page that accurately describes the product in all respects, including (but not limited to) the following attributes: manufacturer, edition, binding, version, format, or player compatibility. Sellers may not match their item to a detail page with a different ISBN, UPC, EAN, or other external identifier. Sellers may not match their item to a detail page with a different ISBN, UPC, EAN, or other external identifier. Pre-sells of BMVD Products: Sellers should not list or match against Books, Music, Video, or DVD products that Amazon designates as pre-orderable. BMVD Products offered through Amazon must be shipped within 2 business days of the date the order confirmation is made available to you. Don’t upsell additional products during the service. “Upselling: The service provider must perform the service as outlined in the scope of work on the service detail page on the date the service was purchased. The service provider may not solicit additional products, parts, or service orders before, during, or after the service call. Don’t send unapproved technicians in your stead. And that’s it. Of course, this agreement is always subject to change, so keep posted for updates. The basic rule of thumb should be “if it seems like a bad idea, it’s probably a bad idea.” Always err on the side of caution. If you have any questions or comments, feel free to leave them in the comments below. I opened an account at Amazon, and they opened the bill to me and a quarter of an hour later they suspended it. After they charged me $ 40, I gave them a notarized certificate for the passport, and they wanted a permit for electricity or municipal taxes. At this stage I did not understand what they wanted, He told me that I would close the account and then open a new account in an orderly manner, but then they told me that they no longer answered my emails, and they really did not answer me anymore, and that’s what I did, so I opened a new account and submitted everything in an orderly manner. Here they opened my account. They charged me $ 40 and after fifteen minutes they suspended my account because they saw that this account is connected to the previous account, which is not I do not want to sell Amazon, and here they wrote to me, we do not answer your emails. Question 1 – Is there anything to do and if I bring them the documents they wanted then they will open the account to me or they have already marked me and will not let me sell more in Amazon. Question 2- Now I also understand that I have 2 accounts in this issue and can I arrange it. Question 3 – In case they do not open the account to me, are they returning the money of the subscription fee or not? Question 4 – Who can I contact to help me with this, Amazon does not have phone service to sellers and I can not get them? Question 5 – Is there anything external that can help me with this? Thanks for the great info. I have a question regarding seperate seller central accounts. I’m just getting started with fba. I’m an American citizen who resides in Australia. I opened an Amazon seller account a few years ago. I would like to start selling via fba in the US and in Australia. Would I also have to open a second account in Australia now that Amazon has arrived? Just trying to avoid and confusion as far as banking etc. I was told by a friend that I would also need to open a seller central account for Amazon.com.au as well. I just want to do the right thing to avoid being banned. Any help is greatly appreciated. Good question. Yes, you’d probably need a separate account unless Amazon’s AU has integrated directly with America (which looking at my SC it doesn’t seem like it has yet). You might contact seller support to see what’s up. Hi thanks for the great summary. Question: the JumpSend webinar Greg and Adam did around May 14 included the email sent to buyers of the Sleeping Bag. It included this phrase: . . . IF you are HAPPY with your purchase, I’d really appreciate it if you could…… [etc. leave a review]. So, my question is, how does that square? I am okay with pushing boundaries, but I just want to know if you have had any pushback from AZ on that, or if you accidentally did that, or are not worried about the consequences . . . etc.? Good question. Knowing what works and what doesn’t with Amazon TOS, unfortunately, varies day to day and seller support rep to seller support rep. I can say that the worst I’ve ever seen happen to sellers is a review get deleted. Typically, Amazon shuts down the actual reviewers a lot faster than their sellers. 1. As an FBA seller, lets say I log into my account in the middle of the day, and change my price from $10 to $11 in the middle of the day, I do not know if orders have just been placed, or if they have been placed in the cart. Is changing the price here the same as raising after the transaction is complete ? 2. If someone leaves positive seller feedback is it ok to say, “Thank you so much for the seller feedback. If you have any feedback on the product, please leave a product review as well”, along with some directions to do so ? For some reason, I get a lot of people who take the trouble to leave me a seller review, and not a product review. 1) I believe whenever you change your price and people have your product in their cart, Amazon will auto-remove the item from your cart. However, it isn’t the same as raising it after complete. I believe that’s mostly for FBM sellers trying to be janky after a deal. 2) I believe that’s okay, so long as it’s for everyone and you’re not obviously going after those that you know had a good experience. Interestingly, Amazon penalizes reviewers more than sellers when it comes to fake/fraudulent reviews. As far as product reviews vs seller reviews, I honestly think that most of Amazon’s customers don’t know the difference! I’m just getting started and think I found a good product but I am finding that there are SO MANY products that are listed in my category that shouldn’t be that it makes my product go WAY down to page 32! There were a bunch of problems with some of the listings I saw – like the photo had a lot more in it than what was actually being sold, and items came up in the search that didn’t seem to match the search criteria I put in – so I am wondering if those products were listed in more than one category…? I called Seller Support and they said to report violations through the website. They didn’t seem to have an internal system set up to monitor that unless there was a complaint. If there weren’t all these problems, I would be much higher up in the pecking order. I reported some of these things through the link on their detail page to Amazon but doesn’t Amazon monitor what is posted? Is that our job to police others? I can’t go through 100,000 detail pages. I spent three hours on it this morning and didn’t even scrap the surface. Thanks for any suggestions you have! If there are clear listing violations, yes, you can report those to Amazon. Our general recommendation would be to use PPC and promotions to make sure your product is relevant in the eyes of Amazon’s search algorithm. You might also try using AMS to advertise your listing on the pages of your competitors. Thank you for the doing all the dirty work in order to provide us with a succinct and concise summary. Much appreciated ! !